How Do I Prepare For My Nursing Board Exam? Preparing for your nursing board exam is the last big step towards becoming a nurse. After years of study and hard work, you’ve almost reached your goal of becoming a nurse. All you have to do is pass the nursing board exam. Here are some tips on how to prepare for the nursing board exam. As with any exam, half the battle is being prepared. This is especially true whether it comes to passing the National Council Licensure Examination for Registered Nurses (NCLEX-RN) or the National Council Licensure Examination for Practical/Vocational Nurses (NCLEX-PN). To successfully complete a nursing program requires study, dedication and a lot of hard work. Although it may seem like the worst is over, passing the exam is an equally big step. In January 2014, the Professional Regulation Committee (PRC) and the Board of Nursing released the results of the nursing board exam taken in December 2013. Of the 35,475 people who took the exam, 10,977 passed, which is less than 31%. If anything, this is a testament of not only the difficulty of this test but also how important it is to be adequately prepared. Just because you’ve successfully aced all your nursing courses and clinicals and are ready to take the nursing board exam doesn’t mean you’re fully eligible and prepared to take the test. Before you can take the exam you’ll need to apply for an Authorization to Test (ATT) from your state’s Board of Nursing. You also need to register with a Pearson VUE testing site in your area, which is where you will take your test. Your ATT has an expiration date so it’s important to register to take the nursing board exam as soon as possible. Keep in mind that the chairs fill up quickly so don’t wait until the last minute to register. You’ll also want to find out where the site is located. Make it a point to review the Candidate Bulletin, which will give you an idea of the format of the exam. 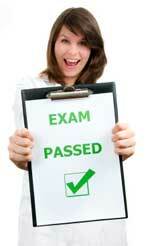 You will need to provide a valid ID and present your ATT when you take the nursing board exam. We’ve all made the comment, “I wish I knew what was on the test”. Well, you’re in luck because you can go to the National Council of State Boards of Nursing and get some valuable information on what to expect on the test. They offer a NCLEX test plan that outlines what is covered on your nursing board exam. While this plan doesn’t give you the exact questions on the test, it generalizes the areas that are covered so you know what to concentrate on when you study. It also tells you what percent of each specific area is covered on the test. Although following the above advice won’t guarantee that you’ll pass the nursing board exam, hopefully, it’ll provide you with some guidelines and tips that can help you enter this process with a positive outlook. Just remember, preparation is half the battle. Get a good night’s rest and eat a healthy meal the day of the exam. These few things can make it much easier to be successful on the nursing board exam. Next Steps: How Should I Prepare for My First Interview for a Nursing Position?